“The Croods” is the latest 3D animation film from DreamWorks. "The Croods" will take us back to the beginning of time - in a previously undiscovered era known as the Croodacious - where Mother Nature herself was still experimenting on what flora and fauna would work. In this era we find the Crood family led by Grug (Nicolas Cage), an over-protective father who, like all dads, is doing all he can to hold his family together at a time when cataclysmic changes are happening. Together with his wife (Catherine Keener), kids (Emma Stone and Clark Duke) and ornery mother-in-law (Cloris Leachman), Grug guides his family through this spectacular environment, full of amazing creatures, to find a new cave to call home. Along the way, they encounter Guy (Ryan Reynolds), an imaginative and resourceful newcomer who takes risks and wholeheartedly embraces the promise of tomorrow. 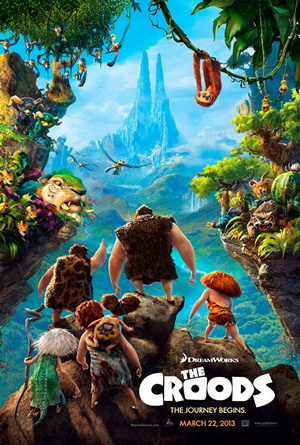 Catch the first international trailer of "The Croods" after the break. “The Croods” will open in cinemas March 30, 2013 to be distributed by 20th Century Fox.